Sponge fruit, iced, tiered, layered, sandwiched or covered in chocolate...your wedding cake should be one of the areas of your big day where you can really go to town expressing your personality. That's why it's crucial to find a designer who really understands what you want to do with your cake, is able to give you some great ideas and is totally capable of carrying them out. Make sure your confection's a floaty-light triumph with this guide to finding the perfect cake creator. The biggest factor in determining the type of cake you have is your personal taste. Traditional fruit cake's fallen out of favour in recent years, so if you'd prefer a gooey chocolate gateau or nut-filled carrot cake, it can easily be arranged! Bear in mind that some types of cake won't stand up to elaborate tiering, so if you're a sucker for sponge cake, consider either a single layer or having more solid cakes on the lower tiers. Of course, you don't have to have a traditional cake at all - towers of cupcakes, meringue nests or brownies can be decorated easily and are much simpler to separate into individual portions. The classic French croquembouche - a tower of profiteroles - is also a gorgeous substitute for a formal dessert. A word to the wise; if you're offering your guests dining options such as gluten-free or ask them to list food allergies, consider a tiered cake with layers that will accommodate different dietary needs. After all, you wouldn't want people to be denying themselves the good things in life on your big day! Cakes take time and effort to prepare, so you'll need to get your booking in well in advance to ensure your chosen designer will be available on the day. This, of course, means beginning your research early. Check out magazines and local decorators for ideas - most firms have websites with galleries of their recent work. Once you've got some ideas, it's time to start making appointments to meet the decorators. At the consultation, you'll need to provide details including date, number of guests, colour scheme and budget as well as putting forward your style suggestions. The designers can then tell you what sort of cake's achievable on your budget, and discuss ways to adapt more elaborate designs into simpler, cheaper versions. When making your booking, if you've gone with a firm, make sure the person you talked to and liked is the one who'll be responsible for your cake. A sympathetic designer makes all the difference to how the finished article turns out. 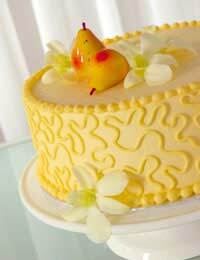 You should also arrange to attend tastings before the big day to sample the cake and decorations. The ingredients used will play a big part in the taste of the cake - so if you're not happy with the initial flavour, it could mean paying more money before you see an improvement. Any designer who claims they can assemble a wedding cake the day before it's eaten is either a poor craftsman or not telling the truth! The complex icing and decorating on wedding cakes means they can take anything up to a week to get right. While at your consultation, you should ask how long your chosen design will take to complete. This may affect the type of cake you use - a sponge won't keep very well after a couple of days, while fruit cakes can last for months after baking. Check also when work will begin on your cake - you don't want it sitting round for days before the wedding. Fresh flowers on the cake obviously need to be added at the last minute. Some designers will be happy to liaise with your florist to get the blooms, while others will expect you to add them yourself. If you're going to use flowers on your cake, don't forget to check who'll be obtaining them. Delivery is a crucial part of your initial negotiations - will the firm bring your cake round at the appropriate time, or will you need to collect it? If it's the latter, get expert instructions on transporting your creation and arm whoever's picking it up with the information. It'd be a pity if your fabulous cake arrived intact only to languish uneaten because you'd forgotten a knife. Your reception venue may provide a cake stand and cutting knife as part of the wedding package, or your designer may be happy to supply one. If the worst should happen, agree an 'emergency procedure' with your supplier beforehand. They may be able to come round and fix any damage, or simply supply extra icing and decorations to be added should some fall off in transit! Finally, when it's time to cut the cake, ensure there's somebody on hand to photograph the moments before and during the ritual. Your decorator won't get any better thanks than a shot of your guests admiring the finished creation and the happy couple beaming as they wield the knife. For them, it's literally the icing on the cake.